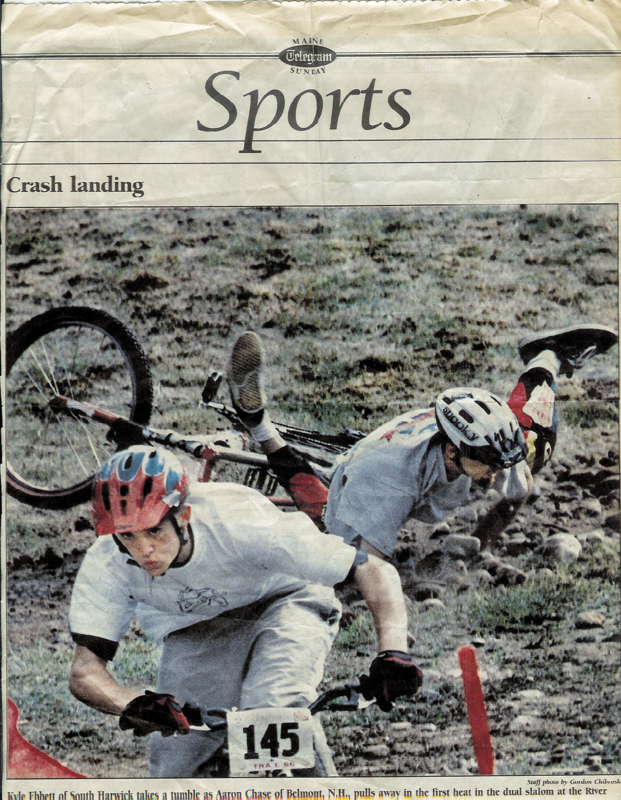 When Kyle heard about the first ever Winter Teva Mountain Games dual slalom, he wanted the win… BAD! 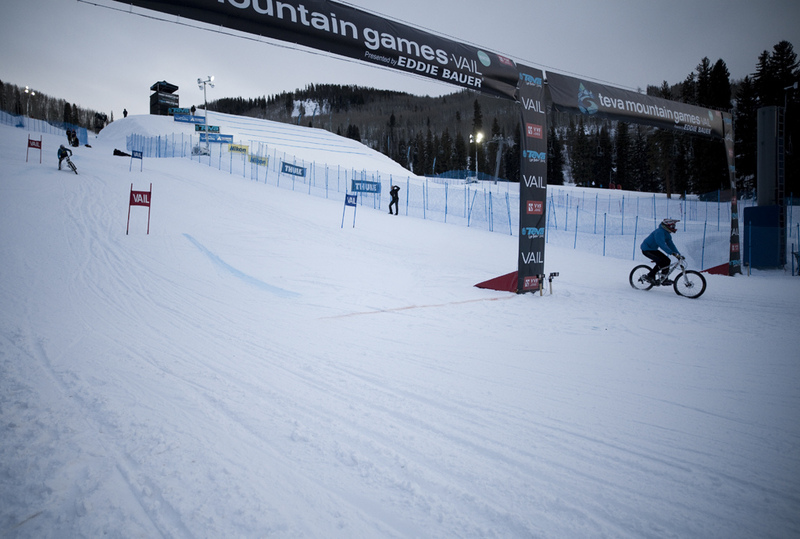 The odds were stacked in his favor since he’s most experienced snow slalom racers, along with Aaron Chase. Still, it takes more than experience. Preparation, control, and no mistakes. 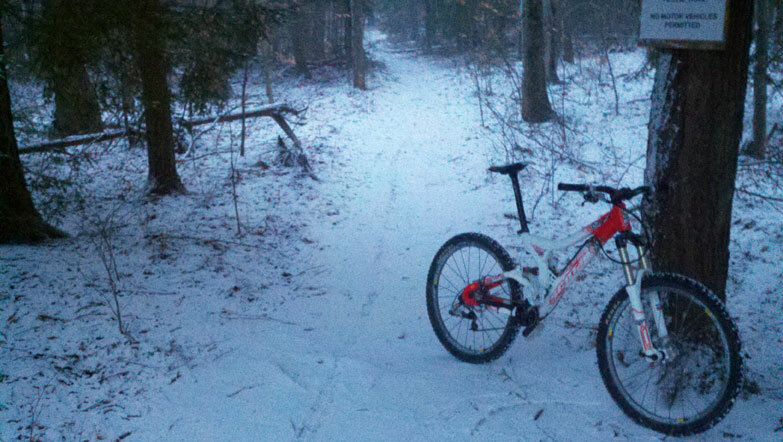 Even with studded tires, getting a bike to change direction on snow takes incredible balance, control and sensitive braking. You can’t just go full speed into turn like you would into a berm. That’s the beauty of slalom; the finesse it takes to turn while maintaining speed. Kyle prepared by riding on ice and snow right out the backyard. In Vermont for the past 2 months there has only been ice and snow. He also spent hours studding up his tires and tested different screw configurations. The field for dual slalom was full with 34 athletes and 16 would move on from a one-run qualifier to the elimination rounds. Kyle threw down a fast enough run to qualify 2nd. Aaron Chase qualified 1st. There were a lot of top racers to contend with including Chris Van Dine, Peter Hanak, Brain Buell, Dave Ziegman, and Eric Porter. The path to the finals would not be easy. It takes three 2-run races to get to the finals. Both Aaron and Kyle eliminated whoever got in the gate with them. Now in the finals, Kyle knew everything was on the line. Planning for a season of racing, he needed to know that he was back at a competitive level. Now all the training, prep, experience, and tire selection came down to 2 runs. Plus, he was racing Chase. A rivalry that goes back 15 years. Ebbett took the win this time. Kyle rode amazingly and went on to take win.